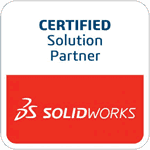 Professional SOLIDWORKS 2016 training tutorials that teach best practices, expert level skills, and shows you all the steps. "Quite helpful to learning how SolidWorks approaches Sheet Metal Design. Coming from an Inventor background it helped translate to the new functionality." Training for SolidWorks doesn’t get any better than this. By the way, Stephen was right. We do have a different teach approach that’s designed to quickly get you up to speed. We work hard to assure that our customers get the best, and it shows. Read reviews from our customers. Our SolidWorks training courses don’t just show you how the commands work, they give you the skills you need to use them effectively. You know that 3D-CAD is supposed to increase your productivity, but in order to do this you need to know the details about how the commands work. More importantly you need to know effective ways of getting your work done. Our courses strike at the heart of this problem by showing you how to be effective. You start with the basics and progressively build a strong understanding of how the commands work as well as how to use them effectively. This will help you maximize your productivity and the quality of your work. This course covers all the modeling commands commonly used in a professional environment. You’ll learn how to quickly create bulletproof models in the shortest time possible, and you’ll learn tips and techniques that will assure that your models can easily be edited. Beginner and advanced users should start with this course because it provides founding concepts for advanced operations and procedures discussed in later courses. Professional Modeling has over 7 hours of instruction. This is the second course in the series. It’s designed to expand your part modeling skills and establish a strong assembly design and construction practice. You will learn all the details of creating and using configurations, using Excel worksheets to generate parts, creating Weldments and frames, multi-body modeling, and too much to mention here. Click the link above to learn more. Advanced Parts and Assemblies has over 8 hours of instruction. Learn how to create professional mechanical drawings from the components and assemblies constructed in the first two courses. All the commands associated with 2D drawings are covered in detail. Learn how to create custom title blocks that automatically fill out information about the part or assembly in the drawing. Create custom borders, custom sheet formats, custom revision tables, custom BOMs, everything you need to create professional drawings. Also learn tips and tricks that will help you speed up your work and simplify drawing creation. This course has over 4 hours of instruction. Learn how to create professional sheet metal parts and assemblies while you explore best practice techniques and learn all the commands. This course is loaded with all the details required to accurately and successfully create bulletproof sheet metal parts and assemblies. It even comes with a K-Factor calculator that will calculate bend allowances, bend deductions, set backs, and K-Factors. You’ll also learn how to work with multi-body sheet metal parts to quickly and accurately create sheet metal assemblies. Tired of setting sheet metal settings? This course shows you how to create sheet metal templates that streamline the process. Even if you don’t make sheet metal parts, this course is a must see. Many of the advanced concepts taught in the course can be applied to standard parts. So be sure to include this course with your purchase. This course has over 4 hours of instruction. Learn how to test the stress of your parts. Discover best practices and how FEA works. There are many advanced concepts taught in this course, so it’s important to have a strong foundation of skills in SolidWorks 2016 when you begin. This course has over 3 hours of instruction.